Harman Kardon accidentally reveals its Cortana-powered speaker | What Hi-Fi? 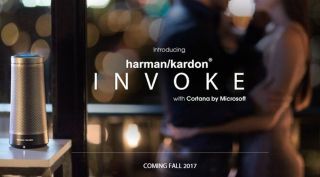 Harman Kardon's Invoke speaker will be powered by Microsoft's Cortana personal assistant, and will include 360-degree sound and Skype calling. Harman Kardon has accidentally revealed its first speaker powered by Microsoft's Cortana personal assistant. The firm set live the product page early (as spotted by Thurrott.com, via The Verge) before realising its error and pulling it. The speaker is called Invoke. Like the Amazon Echo smart speaker, it has a cylindrical design and will be able to answer questions that you pose, as well as carrying out tasks like playing song requests. It will also include 360-degree sound, and be equipped for Skype calls (Skype is owned by Microsoft). MORE: Amazon Echo vs Google Home - which is better? Harman Kardon was bought by Samsung late last year. Samsung has a virtual assistant of its own called Bixby, designed to compete with Cortana, Siri, Alexa and Google Assistant. Presumably it's not ready to be integrated into speakers just yet. Or maybe Harman was already working on the device before Samsung took it over. Harman also announced a tie-up with Lenovo at the start of the year, which saw the two collaborate on a special edition of a speaker powered by Amazon's Alexa virtual assistant. Invoke will launch in the autumn. We're expecting more details about the speaker at the Microsoft Build Conference later this week. Until then, we'll have to make do with the video above.